At Cartel we pride ourselves on providing every beauty service that a woman could need all in one convenient location. Our hair stylists are specialized in any and all of the treatments you could desire. In addition, our staff has experienced nail technicians that will take care of all your manicure and pedicure needs. We also offer several special services including professional make up application and hair styling for special events such as weddings. Cartel offers several different services specialized for mens grooming. Everything from haircuts and color enhancement to keratin softening treatments. We also provide body hair grooming services, manicures and pedicures, and massages for those of you who want to take a moment to relax. We have whatever you need to get yourself looking and feeling at the top of your game. If your looking for a more specialized skincare treatment we have a great selection at Cartel. 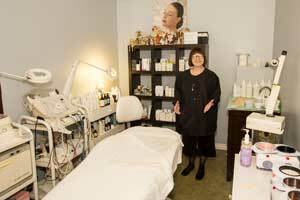 We offer facials, specialty masques, vitamin treatments, and professional makeup applications. So whether you desire to rejuvenate or detox your skin, or maybe you just want to look your best for a special event, everything you want is here. Cartel offers a wide variety of services, sometimes its hard to fit those all into the afore mentioned categories, so here we have a listing of everything else that you many not have been able to find above. Cartel has the best massage in Orange County, everything from Swedish to Deep tissue.